For his third solo exhibition at Monica De Cardenas Benjamin Senior presents a series of new egg tempera paintings. In these new works the artist places greater emphasis on social engagement. 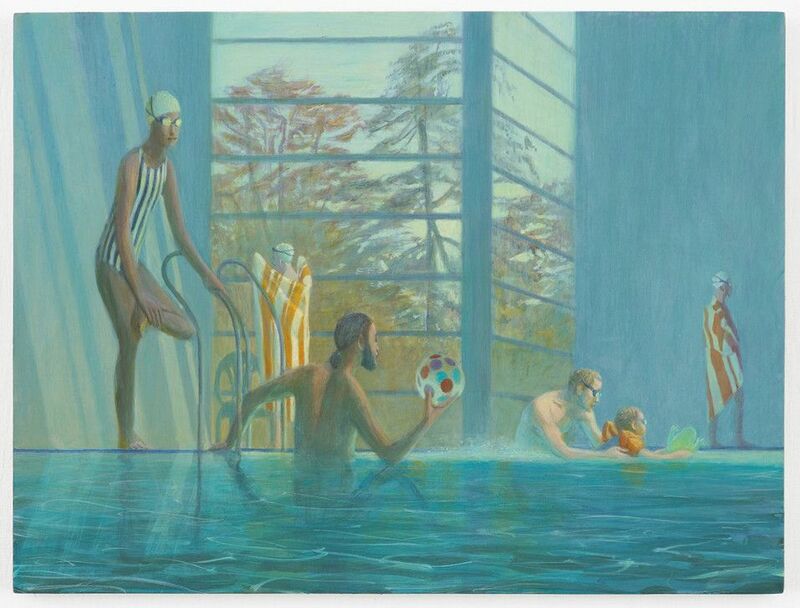 Figures interact through swimming lessons, feeding animals and leisure time at the beach in scenes of social harmony. The presence of animals questions the innocence of the scenes, evoking an unspoken undercurrent of instinctual impulses and appetites. While Senior is a painter of contemporary life, he takes inspiration from earlier painters such as Poussin and Seurat. Groupings of figures are carefully choreographed. It is an ensemble cast – no single figure dominates, rather each figure contributes to the whole rhythm of the scene. Individual bodies are visually connected to form a larger organism. The checks, stripes, spots and diamonds of the architecture and clothing act as harmonic components inside the composition establishing a dialogue with the figures. The history of realist painting has always carried the hidden pleasures of composition; while abstract art thought to do away with the image in the name of “pure” form. But Senior lets abstraction’s ideal of flat design clash with the illusion of depth, each contradicting the other, both tangled in a strange embrace. Somewhere in Senior’s paintings is the question of who, in a painting, the human figure addresses, of whether that figure is a subject or an object, of who is looked at and who does the looking. A question about the nature of this peculiar screen we call a painting, and the world we see upon it. Benjamin Senior was born in 1982 and he lives in London, where he received MA in painting from the Royal College of Art in 2010. He held solos exhibitions at Bolte Lang, Zurich; James Fuentes in New York; Studio Voltaire in London and at Grey Noisein Dubai. Residencies and awards include: Kingsgate Workshops Trust Residency 2011 – 2012 and the Gordon Luton Prize for Painting, 2010.